A high-school professor of theology and physics, Sorin Apin has maintained a lon-standing avocation as collector of folk crafts (costumes) and oral histories (songs). These are stored and studied in his modest apartment in Brasov. 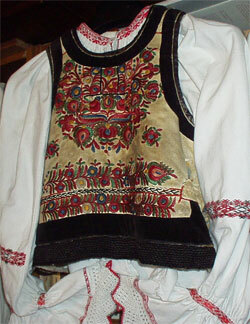 His study of female costumes, particularly in Maramures, has led to the conclusion that the stiched patterns represent more than simple decorative motifs. The costume itself is “a temple carried on a living being.” The symbolic language expressed on a costume links back to pre-history lore of an “axis mundi” centered on paradise island from which grew a primordial tree, its roots in hell and its branches reaching into paradise. His study of oral histories carried down through the ages as songs led to a revelation otherwise dismissed as meaningless phraseologies. Frequent references to ‘seas’, disasters, and floods were suddenly made relevant by the research of Robert Ballard in the Black Sea. These songs, Apan suggests, recall the flood — biblical in scope – that occurred when melting ice caps led to the breaking of the Bosphorus barrier and inundation of the Black Sea plains. Prof. Apan is working with others to save the Village of Bogata – more (40km NW of Brasov). It was threatened for destruction by Ceausescu and saved after an international outcry. Go to this page for a unique story of persistence and dedication by this small village community. This page was created to provide insights into Romanian culture and background for visitors to Romanian. 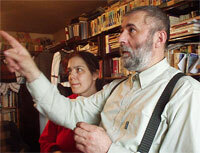 Above: Ioan Sorin Apan and his wife Mihaela in their library and artifact collection in Brasov, Romania. A women’s Maramures clothing shown and an example (left) from Oltenia in full. 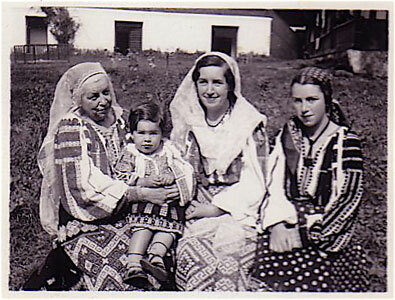 Below: Example of costumes from Rucar (Arges County) of the Honorary Consul’s Bastea family. Photographed in 1934.